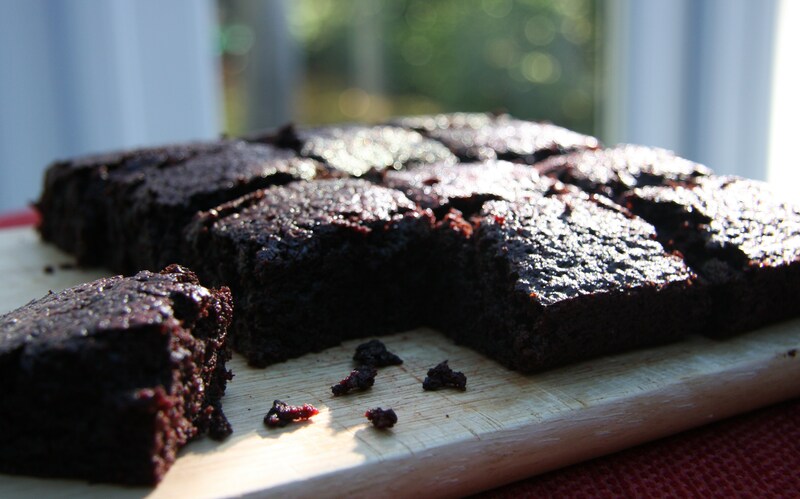 Home › Baking › Chocolate Brownies with beetroot – shh, don’t tell the kids! Chocolate Brownies with beetroot – shh, don’t tell the kids! I had some beetroot in my vegetable box this week, which always seems like a good thing at the time but I generally spend a week wondering what to do with it. Last time I had beetroot I made a Chocolate and Ginger Beetroot Cake which was delicious but I really wanted to try and make some brownies with them this time. I looked at loads of different beetroot brownie recipes but a lot seemed unnecessarily complicated and had a lot in common with making mayonnaise. Possibly why you also see mayonnaise in some brownie recipes, I assume. Yes, really. So instead I found a standard brownie recipe and adapted it slightly to incorporate beetroot. It worked really well and they taste delicious but are probably more of a really squishy chocolate cake than a true brownie. They have a really lovely colour and, if you know what’s in them, a slightly earthy taste. Kids will love them, right up to the point where someone tells them they contain beetroot. I washed and chopped up the beetroot so that all the pieces were the same size as the smallest whole beetroot. Had they all been the same size I wouldn’t have chopped them at all. I sprayed a little oil on them and put them in the oven at around 200°C to cook until they were soft. Then I left them to cool and peeled them once they were. You could also boil or steam them. You can keep them in a plastic tub in the fridge until you are ready to use them. I took out enough of my beetroot to make a warm beetroot and mackerel salad. And given that I wouldn’t usually choose beetroot it was surprisingly tasty. That left me with about 140g so that’s what I put in the brownies. To make them ready for the brownies you need to purée them in a food processor. Mine didn’t purée properly, they were just very finely chopped. Set the oven to 180ºC. Grease and line an 8″x 7″ tin. Beat the eggs and sugar together until pale and fluffy. Then beat in the cooled butter, vanilla essence and puréed beetroot. Sift the flour and cocoa powder together and then mix into the beetroot mixture. Pour into the tin and bake for around 25 minutes or until risen and set. Allow to cool in the tin (if you can!). And thanks to Eden for taking such a great photo of them: we didn’t have to waste any time before eating them! Perfect with a cup of coffee after a run round Virgina Water, thank you. yum! looks delicious! have you tried sneaking black beans into your brownies or cupcakes? also very good. These sound gorgeous… I love beetroot in cake, especially chocolate! That’s very kind of you, thank you! Sadly not a famous blogger yet but still hoping!